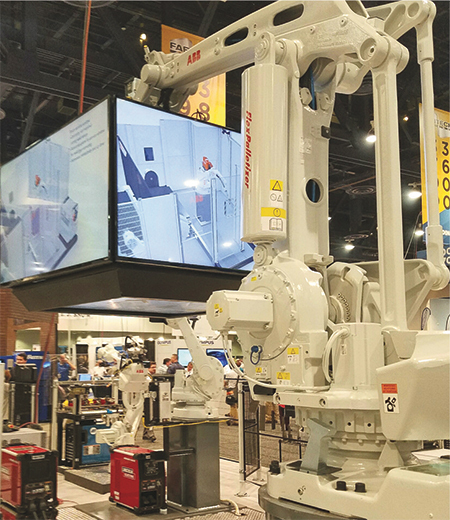 The FABTECH booth of ABB, Auburn Hills, MI, included more than a dozen robots and covered a range of applications, from arc, plasma and spot welding, to laser cutting, robotic gas-tungsten-arc welding and material handling. The centerpiece: a simulated material-handling and welding cell comprised of four ABB robots of differing sizes, reaches and payloads, highlighting the accurate coordination of complex motion patterns enabled by the MultiMove function of ABB’s IRC5 controller. Using a single controller, the MultiMove programming instructions moved all 20 robot axes in fully coordinated motion, allowing the robots to collaboratively work on the same part or within the same manufacturing process. MultiMove can coordinate as many as 36 axes simultaneously. Included in this demo was the IRB 1660ID, the company’s latest compact robot for arc-welding and machine-tending applications. Its integrated Dresspack design reportedly makes it easier to program and simulate predictable cable movements than standard robots with externally routed cables. The demo also included the IRB 800, a 10-axis welding system with an IRB 140 robot attached to the arm of a larger IRB 660 robot. The system provides an economical alternative to a robot traveling on a traditional gantry column, with significantly better cycle times due to its small footprint, longer reach (3.1 m) and ability to work in four separate welding quadrants from a fixed position, according to company officials. Another portion of the demo setup, the IRB 760, a high-speed, full-layer palletizing and material-handling robot with a payload of 450 kg and a reach of 3.2 m.